EZdok Software - !!!!!!! EZCA version 3 coming soon !!!!!!! Topic: !!!!!!! EZCA version 3 coming soon !!!!!!! Subject: !!!!!!! EZCA version 3 coming soon !!!!!!! Looking forward to V3, may I just add that eye point adjustment ( vertically and horizontally )is important and I see a post above requesting sliders, but I would suggest additional to the slider a more finer control using the mouse wheel. This feature is already done. Is tested. Is works. One minor point ... I notice from your screenshot(s), you have the word "Channell". For example, your tabs show "Channell of Mechanisation", "Channell of Engine". The correct (English) spelling is "Channel" with only one "l", not two. It's minor, but simple things like this do get noticed by users. Thank you very much for your comment. We already send for the correction of all text elements of the interface to our English-speaking friends. Already fixed it, but if you find other errors, we will correct them too. Unfortunately, we speak and write well only in Russian. Question: currently I have FSX:SE with EZDOC v1, and P3Dv4 without any "camera's addon" yet. If I buy EZDOC v3 - will it be possible to install it only for P3D without "touching" FSX? In short: I would like to use FSX with EZDOCv1 as it is now, P3D v4 with EZDOC v3. But you can still use old EZ with FSX because both product will install to different folders. before launching another simulator: for example XPlane11 Track IR does not work correctly! Will this be the case with version 3 of EZDOC? Yes . because NP does not give another opportunity to disconnect Tir from Simconnect. X-Plane does not require those Simconnect files.I have no issues using TrackIR with X-Camera in XP11. Another option is the PilotView plugin. Please a question of how to save our existing camera sets of aircraft for the Upcoming V3? 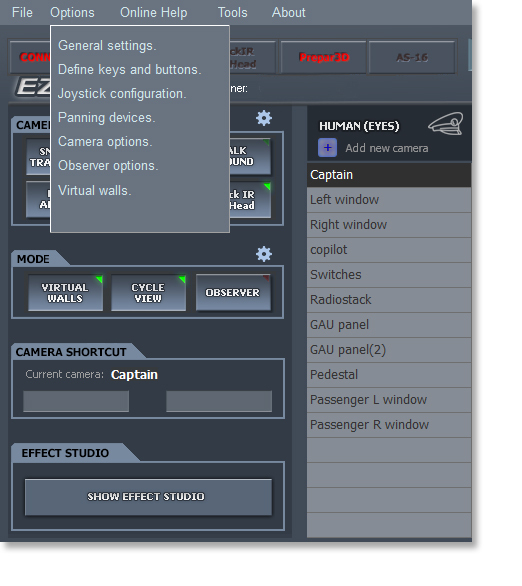 When you install Ezca v3 if you had previously installed Ezca v2 will automatically import (and converted to v3 format) all existing camera sets. Additional feature - import camera sets (v2) from a file (automatically converted to v3 format). Have to unistall before v2. Or? You can save the whole folder. You do not need to uninstall v2 to install v3. Programs are installed in different folders. Thank you so much for ur express reply. Looking forward V3, hopefully soon. At not so extreme low FPS drop. Can it be something on task manager background operation witch infects the performans? Is this in version 2.7 ? For P3D4.3. Once in a while I do a virus scan just to be clear. We know about this issue. After the release of v3, we will make a small update v2 that will fix these freezes and FPS lowers. I'm really looking forward to V3. Do you plan on adding multiple assigments to one joystick button? For example if I program a joystick button for my overhead panel view it would be really cool if I can add a second view (like upper overhead) to that same joystick button. If I press that joystick button I can cycle thru those two views. Guys, V3 in final process now. We want finish it and release as professional product without bugs , without lags , freezes, with new and interest features. And with operational and user manual. Please be patience. trailer video would be nice for now! We are now conducting a fine tuning of the effects of aircraft movement on the ground and during takeoff. In addition, we improve some of the effects of cinematic modes. All of this should be on the video in the form in which we intended, so a small delay with the video. Believe me, there is already something to show, but it should be very convincing)) a little patience, we are almost at the finish line. Is version 3 alredy available? Please link to download. Any News about it ??? It is planned for the end of January. Everything is ready for release, the manual is already written in Russian and is now translated into English. Once the manual is ready, the planned release. The work is boiling ! Now we prepare user manual and videos. EZCA v3 is 100% ready , tested , and waiting for a release date. The date of release - end of Jan.
Uiii, thanks for the Info ! Hi Marniftarr. Is release still on schedule? Yes of course , but release can delayed 1-2 days . Flight1 need to check user manual , then we need solve some troubles with voice acting for video overview. 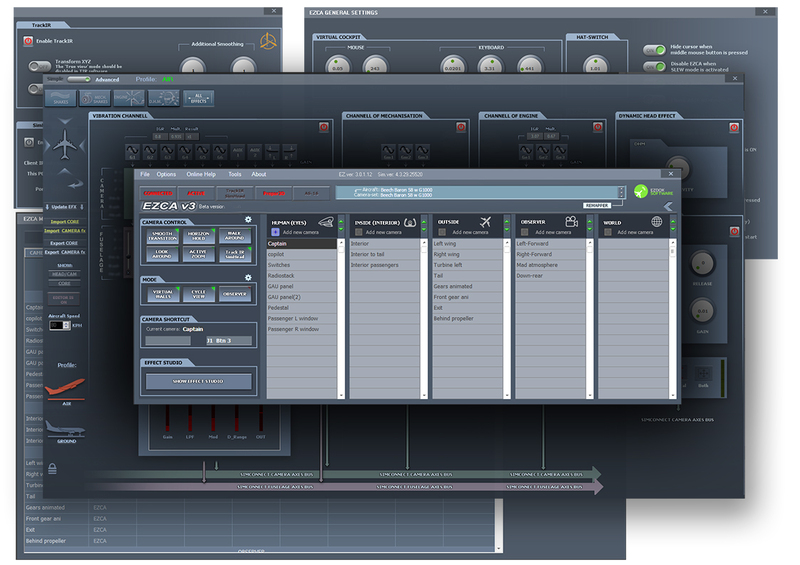 We are fully prepared for the release of EZCA v3 and all materials are transferred to the publisher Flight1. As soon as the Flight1 platform for sale is ready, we will inform you additionally. In the next couple of days we will publish a video preview and a user manual. Follow this thread and thank you for being with us! Guys, please be patience ! Because of the time difference between the continents, we have slow communication (between developers and F1). This leads to release delays. Guys, there's no way we can speed up the release date. Now it's all up to Flight1 when they prepare their store for sale. I think the Flight1 delay is due to the integration of sales into their new NextGenerationPlatform Purchase Agent. See http://www.simforums.com/forums/topic61146.html%20" rel="nofollow - https://www.simforums.com/forums/topic61146.html for more information. We need to unnistall V2 first? Are V2 camera sets compatible? No need to uninstall v2 before install v3. V2 and v3 have separate folders. Camera sets compatible. But you can not use camera-sets of v3 in v2 version. Also do not delete v2 because all camera-sets of v2 wiil transfer automatically after first launch v3. Very simple to install, perfect and professional. Just Hide p3D view sets and the rest is done by the program. If you have v2 it transfers the sets automatically. Just curious, if I have Ezdok V1, is there a discount for v3? Don’t want to sound like I am complaining or expecting discounts, but if both EzdokV3 and chase plane end up costing me the same, I’ll have to think harder about which one to get. Thanks for the release. Once first launch is done and all cameras working, do we need to uninstall v2? Lo siento pero es una traducción de Google. I just upgraded and installed. After a v quick install, loading a flight then reloading tyhe sim (you have to do that) all is working well. Takes a bit of getting used to - first impression is better integration with P3D - it is more integral to the sim than before. I've only done one flight so haven't extensively tested this - and its a Beta I understand. In terms of the experience - straight away the whole thing feels different. With v2 there was a clear conflcit between internal movement, external movement and dynamic head movement, they were not coodinated. In turbulance this could cause disorinetation. On replaying a landing for example, DHM caused huge shudders which had to be turned off. Immediately you can feel the difference in the stability of the view and movement from the cockpit - the movements now feel well coordinated and seem to work impressively well together. As a result, one's view is very much more stable and turbulence effects seem very realistic now, not forced. My flight: Showers and poor weather at Orbx NZSI Orbx Queenstown in the Vertx DA62 to Manpouri RWY8. I run an i5 4690k at 4.4GHz with GTX1080, 32 Gb RAM, 2Tb 720rpm mechanical disk - really smooth and great framerates at pretty high settings - mostly to the right. So all in all a very satisfying experience which I would encourage others to try - thoroughly recommended especially for V2 users as it's only $15. rayharris108 thanks for your feedback. In V3, we interacted with the experience of real pilots. A large number of takeoffs and landings were made in real world in the summer of 2018 . This forced to redesign the algorithms DHM . V3 also tested by three active pilots who are addicted to flight simulator. We interacted in our native language and understood each other. These guys said what was wrong, what was missing, and what was superfluous in the effects ... Thus, there was good control from real pilots during beta testing that lasted 4 months. As result , v3 differs significantly from v2. V3 is Very good,but a problem I found is shortcuts occasionally don't work.I need to restart V3 to restore it.